Air Force Academy personnel will no longer have to keep up with base maps, snow routes and important numbers to be ready for the major snow event. Instead, with a few swipes across their smartphones, they’ll have the information at their fingertips. The 10th Mission Support Group has developed a free phone application called “USAFA Snow” to make the information more accessible. The Air Force Academy snow application contains vital information including base maps, snow routes, important phone numbers, base closure information and survival tips. 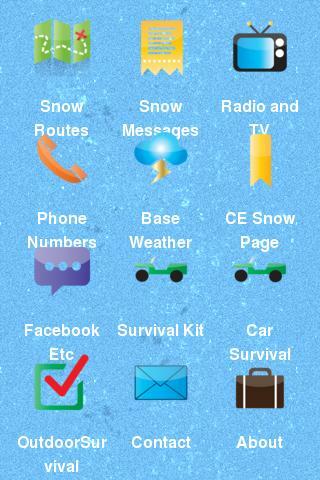 The application is a digital version of the “United States Air Force Academy Snow Routes and Winter Survival” guide that every person working at the Academy should have, said Col. Michael Addison, 10th Mission Support Group commander and application developer, in a press release. Addison said that every employee at the Academy should have the guide with him at all times, but he realizes it’s not always practical. But he knows that most everyone has their cell phone on them. The application is available for Android and iPhone users, or any other smartphone that has a browser. Android users can get the app at the Google Play store, but iPhone users will have to get the link at www.tinyurl.com/usafasnow-iphone, then create a link on the home screen.